I had some comments on two bases that I did so I thought I would post an article on it. I appologize about the photo's as they are blurry. I had my cammera set on the wrong setting and I cant redo the photo's as the bridge is done. So I start out with a set of bamboo shish kabob sticks. You can get these at the store or substitute for some other kind of wood. I then clip (using nail clippers in this case) out a group of these, maybe 7 or so. I will cut these about 1/2 an inch or so. I then cut 4 more pieces about 1/4 inch. 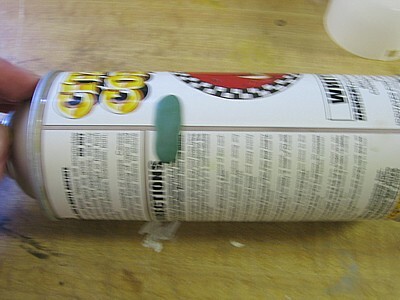 Now I roll out a ball of green stuff and then roll it onto a can. In this case I am using a can of primer. 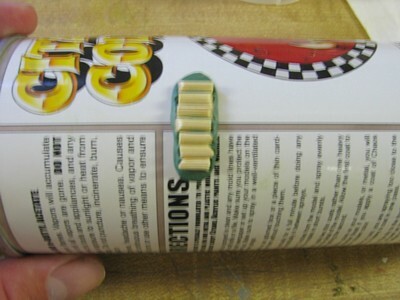 Anything cylinder shape will work but make sure it has a paper cover. If not roll paper around it..You will see why in a sec. I will shape out a basic rectangle shape though I am not too worried about how the green stuff looks. 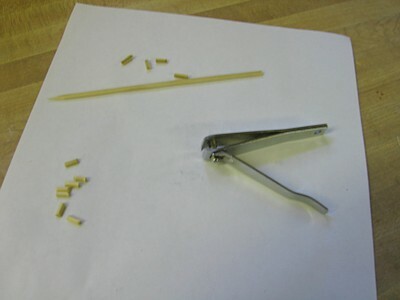 I then press in the LONGER pieces of the previously cut bamboo. I press them in horizontaly with each one touching the other and I make sure to keep them in a straight line. Once this is dry I use a razor to cut the paper around the green stuff. 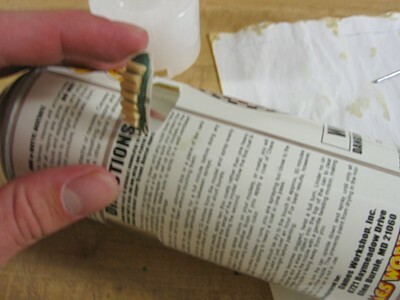 Now for those who are challenged I will warn you that If you cut too hard into the can , and it still has pressure, you will coat yourself in exploding paint. I was able to do this without injury. Now I am sorry for my lack of photo's on this part but you will see it in the finished product. 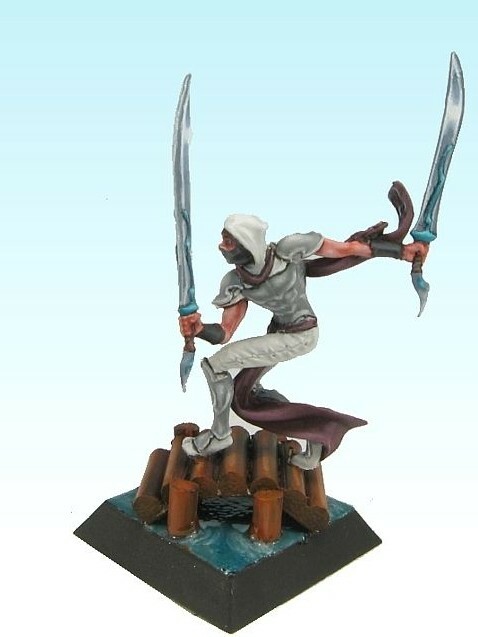 I will take a plastic base and paint it the shade of water that I want. I use dark blue or a brown..and you will be able to see both at the end of this. 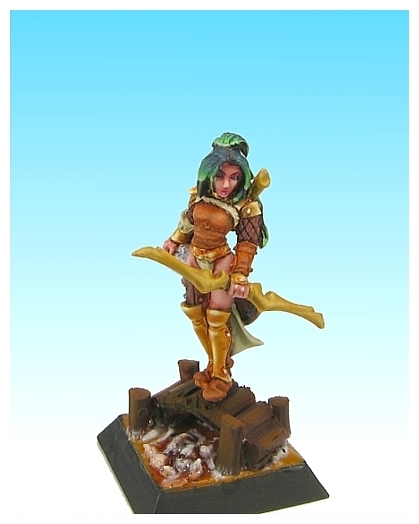 In the first example I paint the base a seinna brown. Once it dries I sprinkle in a few rocks near the area where my bridge enterance is going to be. While this is drying I sand both sides of my bridge so that they are even. This also hides the extra green stuff. Once this is done I take the bridge and glue each side of it down onto my base. I use a little extra pressure (to the ends) if I want my bridge to have more of a curve or less if I want it to be more straight. 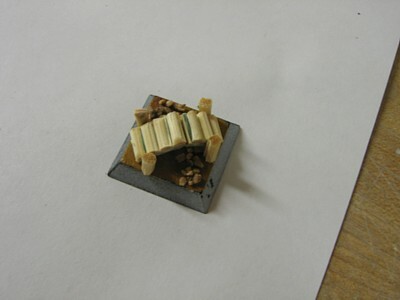 Finally I will glue all four (remaining 1/4 inch pieces) on the four corners of the bridge. Now for the paint. I paint and highlight the bridge any color (in this case brown). Next I use realistic water effect (woodland scenics makes this..I think) and I carfully spread it onto the river bottom. I find that an old paint brush and an eye dropper works good for this. I also make sure not to put this on to thick because I don't want to cover up my rocks. Once the water effect dries its should look perfectly clear. Next I paint a series of lines that will represent the flow and splash of water. I start with a light grey then highlight with white. I have found that if you make short wavy lines that the water flow looks slow and calm. If the lines are long and straight the water flow looks fast. I make sure to put a little extra grey an white where water would hit things, like the bridge posts, rocks ect. Here is a photo of this bridge with a brown river bottom. And one with a blue river bottom. Hopefully this can add some fun to your bases. Happy painting.